I split off from the girls, who wanted to shop, to do some random sightseeing. I thought it might nice to find a church, since I slept in and missed morning Mass. Using google maps, I learned the closest church was the Church of St. Roch, right in the heart of the shopping area of Paris. From the outside, it did not look promising. Homeless people on the steps with trash scattered about. I wasn’t even sure it was open. Turned to be a beautiful church on the inside. Huge murals over the many altars. It was uoriginally built in 1209, but the current structure appears to have been built in 1653. Typical of Europe that this amazing site is barely worth mentioning in tourist material. 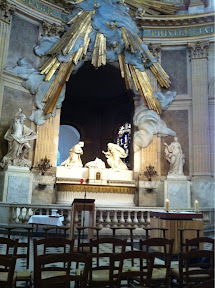 Just as I arrived I noted the telltale signs of people rushing by me to the front of the church behind the main altar. Sure enough, Mass was about to begin.